Explanation: How can two stars create such a strange and intricate structure? Most stars are members of multiple-star systems. Some stars are members of close binary systems where material from one star swirls around the other in an accretion disk. 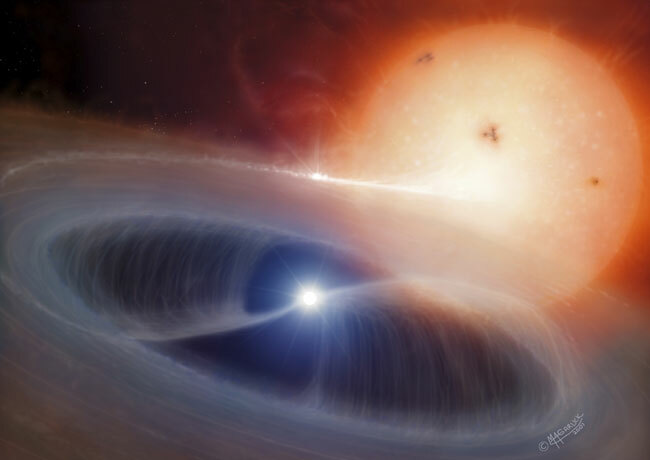 Only a handful of stars, however, are members of an intermediate polar, a system featuring a white dwarf star with a magnetic field that significantly pushes out the inner accretion disk, only allowing material to fall down its magnetic poles. Shown above is an artist's depiction of an intermediate polar system, also known as a DQ Hercules system. The foreground white dwarf is so close to the normal star that it strips away its outer atmosphere. As the white dwarf spins, the columns of infalling gas rotate with it. The name intermediate polar derives from observations of emitted light polarized at a level intermediate to non-disk binary systems known as polars. Intermediate polars are a type of cataclysmic variable star system.